With my classes taking a short break for Christmas and New Year, I finally got my act together and have gone back into my own learning, of teaching and more importantly, of some Japanese. This all translates into my Japanese level remaining at the false beginner level, elementary at the most, and that things are pretty hard going if I were to improve my Japanese – there are always better things to do. My problem is very much like what many Japanese learners of English have, I’m much better at reading than talking and listening because I can understand Kanji in its written form. As I was browsing though bookstores, I could not resist the temptation and have bought yet another Japanese textbook to put on my shelf – as if simply having the book will mean my Japanese can miraculously improve on its own, without any actual studying. My excuse of building a pile of textbooks was that as a difficult learner, I’ve always found it really hard to stick with one textbook. Having several meant I could dip in and out of whichever seems interesting for the day. I also find it impossible to get the perfect textbook. Perhaps any such attempts would be futile, as teachers we should know better that there is no such thing as a perfect textbook. With my recent reading on lessons from good language learners, I’ve realised, unfortunately, I probably belong to the groups outside that category, which means I could benefit from having some strategies and a study plan if I were to have any chance of success. Learning Japanese from Manga. Each unit has a dialogue for a certain situation with a CD. What I like about this book is the fact that the conversations are realistic and as far as I could tell, it has a mixture of formal and informal situations. But what I really like is the grammar points and conversation tips written in Japanese. Apart from the actual dialogues, I found myself learning more from the grammar point section spilling out the tips of how to converse more like a native. The tips aside, I am also learning how to read just above my comprehension level. It feels pretty good to understand grammar points in Japanese. I couldn’t help to draw parallels between some of the strategies suggested in the book and the way we talk in English, perhaps more in a British way. At this point, I wonder, how come my learners (especially those in lower levels) are unable to use the same strategies in making refusals in English? Should the teachers be more explicit in comparing these strategies and perhaps to even spill them out at times? Wouldn’t that be a logical thing to do given that we are in a largely monolingual teaching environment? To draw parallels between strategies and feed in the appropriate language. I wonder how I could turn this into a viable lesson. What did I learn from my education? “There is no such thing as a stupid question.” Mike, my supervisor, said to me on my first day in the lab. Curiosity and having the courage to ask about what you don’t know is what keeps us going forward. He taught me to stop being afraid of the unknown, the unexplained or simply things I didn’t get. Knowing what you don’t know is an essential part of learning and it, in itself, becomes the seeds for continuing the journey of investigations. Teachers don’t always have all the answers, often you have to work them out. The answers might also evolve as we get older, as we gather more facts and start seeing things from different vantage points. As I moved through the different educational systems across continents, I gradually realised that knowing what you don’t know, how to ask questions, how to work things out and when to pause, stop, rewind and reflect are all necessary parts of learning, and for that matter, essential for someone to “function well” in a society. The other crucial thing is having the ability to deal comfortably with uncertainty and some degree of vagueness. As the great physicist Richard Feynman says, “it is not always a good idea to be too precise.” (Feynman, 1998:4-5) Vagueness and imprecision could help draw out questions, opinions and gaps in understanding that would all result in new rounds of communications and the continuation of dialogues towards clearer views. How can you impart this knowledge onto your students? Demonstrate by examples? Treat every student as a unique resource. Everyone has something to give. Step back, take time to listen, observe and draw it out. Challenge: What was the most important thing you learnt from school? Feynman, R. (1998) The meaning of it all. London: Penguin Books Ltd. I had to cover a standalone lesson after my normal evening class. I was apprehensive. It was mixed intermediate level. I had no information about any of the students. But I took it and decided to turn to Teaching Unplugged. I was also eager to see if I could try out some ideas I got from a workshop by Ken Wilson for mixed ability groups. Activity 1: I bet you didn’t know….. The students would have come from different classes, so I thought there would be a good chance that they wouldn’t know each other. (I checked and they didn’t.) But for conversation to flow, I had to give them a chance to get to know each other a little so they would be more comfortable sharing information later. In Ken’s workshop, he talked about what to do when walking into a new class. I modified one of his “Find Someone Who” activities. I asked my students to write down one thing that is a bit different about them, something the other cannot see, something that has happened to them recently. Students get into pairs, introduce themselves and tell their partner that special thing about them. The partner would listen, then make a comment or ask a question. The pair would continue until they run out of things to say or when I say change. A: Hi, I’m Connie. What’s your name? B: I’m Mayu. Nice to meet you. A: I bet you didn’t know that I’ve just got myself a cinema point card! B: Cinema point card? What’s that? As the activity was under way, I monitored and fed in language when needed. I decided to give minimum intervention because I really wanted to draw out the slower speakers and to get a feel of everyone’s levels. I also wanted to give them time to come up with things to say before I jumped in to help. The other good thing was that sometimes their partner was able to jump in before me! From the warmer, it was evident to me that this group could be pretty talkative, so going with a freer conversation driven style would be a good call. Activity 2: Speedy introduction: Have you met….? At this level, I’ve noticed that most learners are pretty good at talking about themselves but could still work on talking about others. 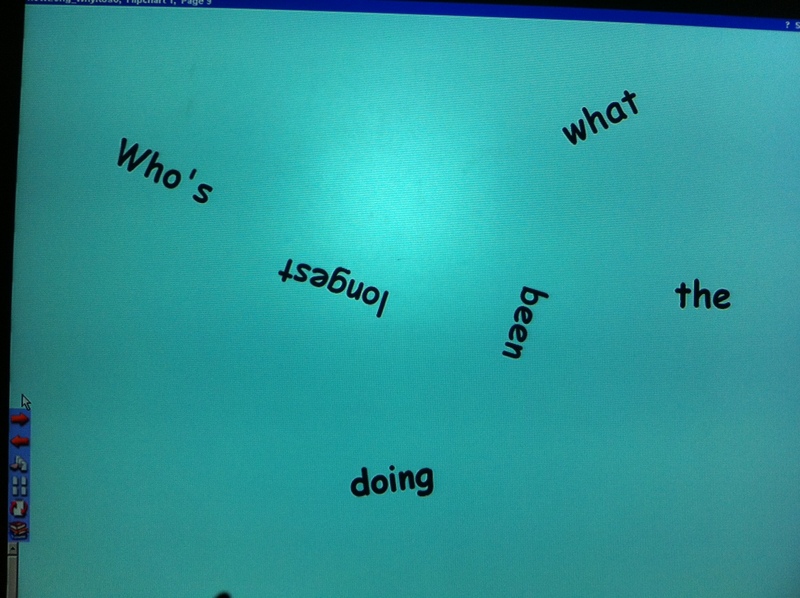 Allowing them to make use of the information they just gathered, I decided our next activity should be a speedy introductory type thing in which a student takes a partner along and has to introduce that person to as many others in the class as possible. M: No, not yet. Hi Jo, I’m Miki. J: Nice to meet you Miki. …. C: Hey Ran, I’d like you to meet Jun. He’s …. J: Nice to meet you Ran. …. This went pretty well. What I would change next time is that if you wanted it to be a bit more controlled. Ask your students to get into pairs. Give a time limit, ask one of the students to make the introduction. Then swap role. In my version, it was a bit chaotic and people just kept talking after the introduction. It wasn’t too much of a problem as everybody seemed to be quite up for a chat. 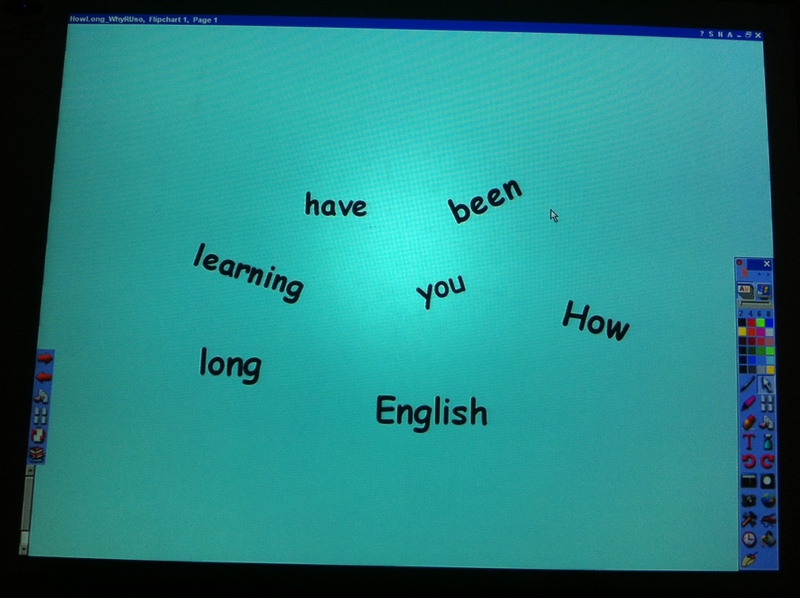 To round off, I asked each student to tell us something about a person they had spoken to or been introduced to. By the end of the 30 minutes, the group has got to know each other pretty well. From what I heard during the monitoring, I thought some students were weak on present perfect and some types of question forms, especially those involving the present perfect and the present perfect continuous. I thought the next logical thing to do would be the “Headlines” activity (p38) from Teaching Unplugged for recounting recent personal events. Each student wrote down a personal headline, something short and sharp so people had to ask questions to find out what it was about. I showed them my headline and got them to ask me a few questions as a class, deliberately not giving too much away for each question so they had to keep asking for more. The student showed me their headlines before I got them to choose a coloured-strip of paper to write out their final version. The students made two circles, took turn to interview each other. I monitored and fed in language and helped with questions. Just like that, 45 minutes went like a blip. To finish off, I asked the students to share their favourite headlines or questions. We got some pretty interesting stories. Quite a few people loved the long drive story. Driving from Tokyo to Miyasaki, many of us were curious how the wife was OK with that. Apparently other road trips like driving from Tokyo to the north tip of Japan have also happened. One of the students (felt so nervous at the party) just came out of the office Christmas party feeling a bit down. With hundreds of people at the party, there were only two of them from her department. She didn’t know anyone, everyone else preferred to stick with their own teams. They went so late that much of the food or drink was gone. Not a great party. Waiting for the right photos guy works at a fitness magazine. They did a photo shoot the other day but then the photographer sent them some random photos that weren’t from the shoot. His deadline was tomorrow but he still seemed quite chilled about it. A few of us were worried for him and was surprised that he still turned up for the class knowing full well of the imminent deadline but having no contingency plans. I really enjoyed the lesson and loved the fact that everybody was given the chance to share what was dear to their heart and finding out that others were interested in what they had to say. But did I do enough feedback? I continue to struggle with that question. What do you do in your Christmas lessons? What activities do you use to help your learners practise? Last week, I used a variation of Go Fish or something similar to the Japanese babanuki game with my first graders. The presents were a list of 8 to 10 popular choices. The items were introduced orally with flashcards, so some students might not have seen these in words. Through this game, the students would get a chance to learn to recognise these words if they did not already know them. To make it more festive, I thought instead of teaching the normal response, I would make it Christmassy! A set of cards with at least two copies of each object in pictures only and two copies of each in words only. The players shuffle the deck and deal 5 or 6 cards to each player. The rest of the cards stay faced down in the middle. All players check their hands and lay down any pairs they have. The player plays rock scissors paper to see who goes first. The player to the left of the person who goes first kicks off with the target question What do you want for Christmas? The player checks her deck and answers “I want a/an/some [______]to try to get a pair. If the player to her left has it, she says, “OK. Merry Christmas!” and hands over the card so the caller can discard the pair. If the player doesn’t have it, she says, “Sorry! Santa says no!” The caller has to pick up a card from the deck. The winner is the first player to lose all her cards. Reward the winner and restart the game. It was fun with a lot of laughters and pretty effective too. This week, my classes were able to recall the target questions and answers with minimal elicitation – I only showed them the flashcards of Santa and presents. It was fantastic to hear all these phrases with the appropriate intonation. I decided on that response in the lesson on the spot as I sensed my students were showing particularly fondness towards Santa. It paid off. How many times have your students tried to use the question as is when they go about doing the survey? Tasks like this could be tricky for lower levels students for various reasons. It might indicate the learners have problems understanding the meaning of the structure or that the task has not been explained properly. The other possibility is that forming questions itself was the problem for some of these learners. But within the same group, there would also be a few learners who find it a no brainer. What should a teacher do when our learners vary in their readiness? To save lengthy explanation and time needed to check and make sure everybody has made the right questions and to provide a chance of drilling them before setting off the task, I tried something different the other day. In the previous lesson, I set my learners the “Find Out” task worksheet with a list of possibilities so they could prepare as homework. We went through an example and I asked them to write down the questions they had to ask when they would do the survey in the following lesson. There are a few things I know about this group: many don’t have time to do homework; most need pronunciation practice but are not so keen on group choral drilling; it would take too long to check and help individual learner make the correct questions and check their pronunciation; everyone has different questions but would benefit from being familiar with the others’ questions; some students have done their homework but could benefit from some feedback so they could improve their questions. How can the teacher help the learners self-correct or improve their questions without doing so explicitly? I have chosen several tricky examples from the list of questions on the “Find Out” task worksheet. We started with the easy one together. The second slide had two questions jumbled up, both of which would be required if the student chose that particular “Find Out” task. The students worked in groups to figure out what the questions were. I used the last puzzle to introduce the “Find Out” task. The students would automatically pay more attention on form, particularly good for the question form. While working out the answer, they would be practising the pronunciation as they are thinking aloud. As each new puzzle appears, the students get the chance to notice and identify the question chunks such as “How long have you been…” and “Do you…” until it becomes automatic. Even students who had prepared the questions would be engaged as they wanted to compare their own questions with what was on the board. Later, they could self-correct, adapt or improve their original questions as they wish. By the end of the activity, most students would be on the same page and they were ready to choose one of the “Find Out” tasks or to write their own. The best thing was many of them have internalized the question chunks and saying them without thinking of individual words. Also the learners get a preview of what they might get asked. This un-jumbling activity could have be done by writing out each puzzle on cards so each group picks up one puzzle at a time, solves it, writes out the answer, checks with the teacher and fetches the next one. But by projecting each puzzle on the board, instead of a reading/writing practice, you are focusing your learners on reading and encouraging them to verbalise their thoughts. Doing it as a whole class also enables the weaker students to get “help” from their stronger peers as the latter think aloud. Of course, it only works if your learners like solving puzzles. Have you ever torn up a banknote? Only three students turned up at the beginning of the lesson. We have been doing “why are you …?” recently. I saw student M was laughing so I asked her why. Nothing much came up. Then I spotted student T yawning. I asked the students if they had trouble sleeping sometimes. A couple said yes so I got everyone to start sharing ways of helping someone fall asleep. We broke into a laugh and were wondering how confusing or frustrating that must have been with the sheep moving at different speeds and doing different things. The rest of the students started trickling in. I tried to include them in the conversation but it seemed hard to keep it going so I decided to show them what I had prepared. I divided them into two groups. I showed them a picture with various money related items on it and gave them 30 seconds to look at it. I asked them to remember as many items as they could from the picture. After checking, we went through the vocabulary and checked the pronunciation. 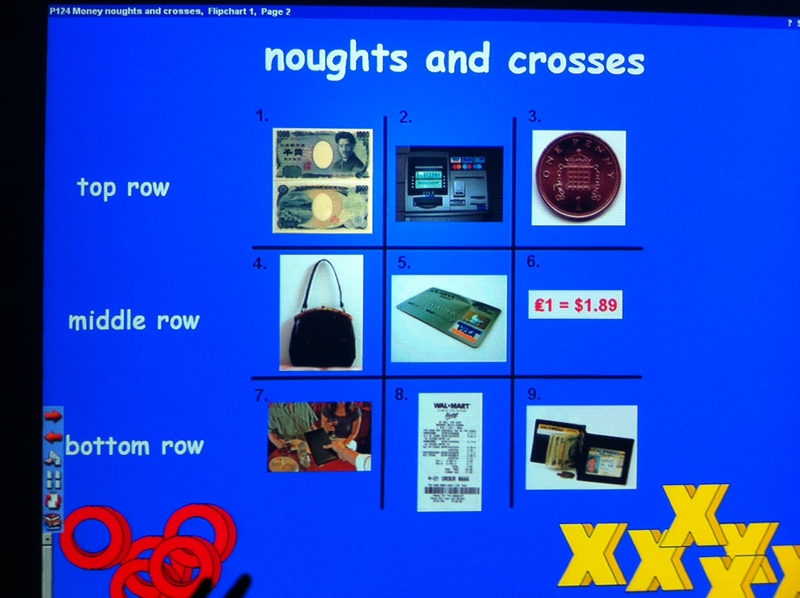 We played noughts and crosses with the two teams competing. 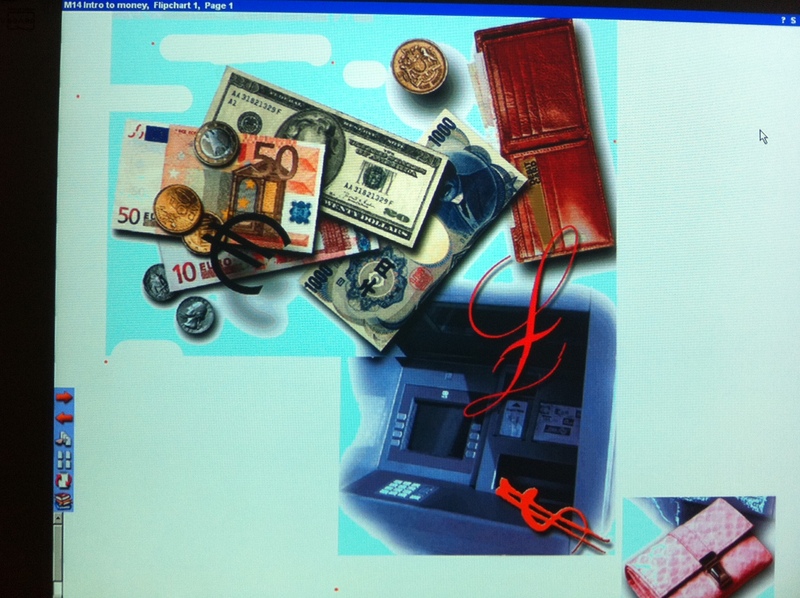 They first had to identify the item, similar objects as those that were on the picture. Then the team had to answer a question correctly to claim the square (again money related item and vocabulary – I took an exercise straight out of the student workbook). It was a pretty good listening exercise and a more interesting way of introducing or activating vocabulary. The other thing was I could actually motivate them to complete that exercise in the workbook as homework so they could see what their own gap was. I made a note to recycle these items throughout the unit. What was important wad that my students and I all got to find what they already knew, what was new and what they weren’t so sure about – a mini pre-assessment to prepare me for the unit. After that, I showed them a sample mindmap and asked them to brainstorm some more lexis on the topic in their groups for a few minutes. The group swapped sheets and checked what the others had. Do you often spend all your money too quickly? Off they went. I monitored, fed in language and participated in some of the conversations. Have you ever used banknotes as a fan? Have you ever spent more than one million yen in one go? He found that nobody had except him. He has spent 3 million yen on a car once. We all had a good laugh. It was a happy lesson. A teacher said to me later that he always saw everybody laughing whenever he walked past our classroom. I liked that. I decided that this would be the kind of classroom I would always aim for. Oops. It looks like this post might have posted itself! It must have got impatient that it had been overtaken post after post. It was my first JALT this year. I felt that I have been bombed by lessons on Ms! My first was on music and movement. Kathleen Kempa did a fun workshop, giving practical ideas on how to integrate concepts of Howard Gardner’s multiple intelligences (or various ways we could be “smart”) in our kids lessons. It was a brilliant workshop packed with actions, chanting, movement and singing. At the end, everyone’s energy was so high, we couldn’t help but to initiate her transition chant “We Did It”. She called it the M&M of lessons for children. Judging from our own reactions, I was convinced that incorporating movement, music and other types of “smartness” in our lessons would work for adults too. A couple of researchers shared their thoughts on multilingualism and bilingualism. Being a bilingual myself, it was very interesting to see what went through a bilingual child’s head as one moved up the educational ladder. There seems to be constant internal conflicts in which an earlier perceived advantage could easily turn round to become a nuisance a moment later. Our mixed feelings might never be resolved and there would be an ongoing battle like someone rowing along a dynamic river. Sometimes progress seems too fast, sometimes it is almost impossible, and at times even staying in place could be a struggle. I knew from then on that as long as I stay in teaching, I will be revisiting this area times and times again. Teaching could be fun but perhaps a lot of the time, it could also be extremely stressful. So I went along to a mindfulness workshop. I have been hearing so much about it lately. Last year, I first heard about it from some RSA talks. Personally I haven’t tried it but I’ve seen its impact up close on my friends and family. Mindfulness practice has also been shown to help Gulf War veterans as they struggled to return to civilian lives after all else had failed. What’s more, its link with neuroscience is intriguing. During the workshop though, there were multiple times I thought it was just a waste of time and had wanted to walk out but I stuck with it. Now I thought perhaps in an alternate universal, I could find it useful providing I could tweak it a bit. Basically we are supposed to cultivate a non-judgemental awareness of ourselves, our body and our mind – especially movements controlled by our unconsciousness: simple things like focusing on the mechanics of breathing – actively trying to consciously experience the unnoticed motions and features of things happening daily in our lives. I was pretty happy with how I felt after the exercise. Besides, it was a chance for me to “grow” my prefrontal cortex, although I remain skeptical. I was glad I went along anyway. After unexpectedly discovering the power of breathing exercise from Tai Chi a few years ago, I felt that anything is possible. Before ending my first day, I attended a forum by Keith Johnson. I was gutted I couldn’t go to his workshop. As an inexperienced teacher, I definitely consider myself a non-expert. But does it always equate to ineffective teaching? The jury is still out. What I got out of the discussion was the growth of a teacher happened when one became more comfortable in taking up the multiple roles or “personas” of a teacher at appropriate times in the classroom: the expert, a participant, an assessor, a facilitator, etc. Reflecting on one’s teaching seems to be the key for new teachers. Something just can’t be taught but can only come with experience and be learned by doing. As a new teacher, I always put the following first: meaning before form and facilitating meaningful interactions by making connections personal. I teach in junior high schools. Invariably most of my classes are mixed abilities and have mixed interests. Ken Wilson put on a practical workshop and let us experience first hand how some of his activities could be adopted in our own classrooms. He effectively demonstrated to us how important it was to use our learners as a valuable resource and to have the ideas and details coming directly from the learners. It does help if the teacher can improvise appropriately. None of what we do matters unless we could somehow create, increase, sustain and reignite motivation among our learners. Again Ken Wilson delivered a brilliant plenary with activities to help motivate our learners. 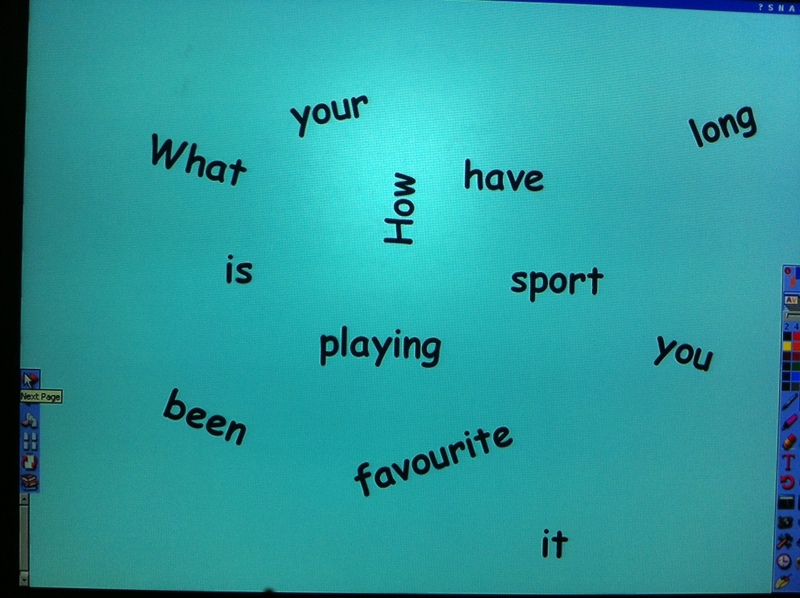 I tried out a jigsaw reading activity with my own class that worked fantastically. I often had trouble getting my adult learners to read anything in the class but not that time! Robert Murphy, on the other hand, showed us some brain friendly ways of motivating our learners to enhance learning. Creating the sense of mystery to fuse curiosity is a strong and recursive theme from both speakers. Memory and learning can be strengthened when mystery combines with emotional connections. Feelings and emotions experienced in the classroom are intricately linked to successful learning in the long run. I hope to see more neuroscience research to clearly visualise this. My intense two days at JALT was a fantastic experience. I hope I will get to go again next year and perhaps join the presenters! It was my second time invigilating an international exam in Tokyo. I was called in mainly because they needed someone to do the announcements in English. A long day, 7am to 6pm. What are your impressions of an exam invigilator? They walk around, often look sleepy, sometimes stare at you as if you are not already nervous enough, ask annoying questions, look at you like a suspect and always try to double, triple check if you are who you say you are, and most of the time, they seem to just sit there and do nothing! To many people, invigilators are pretty annoying and perhaps somewhat unnecessary. Far from it! For an exam to go well, many things have to go right. A lot of planning is involved, especially when an exam happens on the same day around the world. A lot of organisation and precautions are required to make sure things happen accordingly. But as with most events, more often than not, many things do go wrong. Invigilators are part of that team that make sure things can be resolved on the day even when there are hiccups here and there. Without them, all your effort spent on cramming and studying could be compromised, invalidated or violated by unexpected incidents or people who do not play a fair game. Invigilators are in fact the enforcer of fairness on the day of the exam! Wow! The fun and sweats of event management have eluded me for a while since I have been working as a teacher. But I guess daily classroom management has kept my eyes sharp on all kinds of fishy and volatile situations, except that the stake is much higher here and we could only whisper our utterances when discussing issues. With all the organisation and planning ahead, what is the weakest link on the big day? For me, four things have become apparent. Proctors knowing what to do, managing the logistics of people flow, responding to specific logistic issues associated with the venue and dealing with cheating. These are the most important issues we faced given that all the staff and materials had arrived. The proctors to my mind is the weakest of them all. Many are one-timers and have never had the experience of invigilating such a strict exam. A lot of them might have misconceptions about a proctor’s duties, thinking that all they have to do is to turn up, sit there and try to stay awake without making any noise, in another word, easy money for apparently doing nothing. All proctors must read the manual in English before the training session. They must also complete a self test on paper or online in English before the training session. Any common difficulties from the test should be highlighted so these can be strengthened during the training workshop. All proctors must attend a training workshop in which the running order of things for each position is assigned and everybody knows who to report to. During the training workshop, the local organising teams could get proctors into groups and get them to brainstorm questions, situations and solutions. The questions could also be prepared beforehand including problem areas from the self test and are set to each group. This would probably work best in Japan as asking questions might not come naturally for some people. The other problem here is that here people tend to keep nodding to acknowledge hearing the information which does not necessarily equates understanding. All new rules or changes in the regulation should be pointed out. The training workshop could be done in the proctor’s mother tongue but they must also be able to find the solution as mentioned in the manual (which page, which section, etc). Obviously being able to respond in English would be even better. They should be given practice filling in an example of each type of the administrative papers and reports while they are responding to the questions. The session, ideally, should take place no more than two weeks before the actual exam to keep memory fresh. On the day of the exam during the briefing, there should be another short quiz in the proctor’s mother tongue on a few common and essential situations before everyone gets into their position. The supervisor should give a checklist to each lead proctor so they can make sure the necessary paper work is done properly on the day for their section. On the logistics of people flow, it is one of the hardest as there are three important aspects. Firstly, the venue needs to be able to handle a lot of people checking in their belongings efficiently. Secondly, the candidates will want to stay outside for as long as they can before checking into the exam room. Finally, the check-in process needs to happen efficiently and swiftly otherwise the exam materials cannot be distributed and the exam might be delayed. Obviously briefing the venue staff handling the cloakroom is the number one priority, if possible we could broadcast regularly to remind candidates they should check in for the exam as early as possible. But again all of these would be constrained by the venue. For example, it may not be possible to make broadcast outside the exam room reminding candidates to check in early as the venue might be holding a lot of other types of events. The flow of the people, especially during exit, is also limited by the venue. Even if you open extra doors, the cloakroom staff might not be able to handle everyone trying to collect their belonging at the same time. What our venue did, to their credit, was that they just moved everyone’s stuff to another room so people could just go and collect them by themselves during the lunch break. After the lunch break, the candidates were asked to put their stuff back in that room to save time. But I guess this would only work in Japan where it is relatively safe to even leave one’s laptop, wallet and phone on a table unattended in most cafes. Cheating is a big business in this kind of exams. Monitoring it is crucial in ensuring a fair exam. As I was watching this guy trying his hardest to peek and glance at the candidates next to and in front of him throughout the day, I started feeling sorry for him. How obvious can one be on cheating? I have never seen anyone cheating in such a blatantly obvious manner. How frustrating it must be for the person sitting next to him, providing that they are not working together? The other thing is that for proctors, even if we suspected someone might be cheating, we could not expel the candidate. All we could do is to monitor and record what we see as often as we could. So how do you feel now, still think invigilators are a total waste of time? Have you ever been an invigilator? Do you have what it takes to fulfil your duties? I never thought I could have so much to say on invigilating exams just by doing it twice. Perhaps a new career path has just opened up, becoming an exam specialist? Besides, it turned out that I really enjoy making the announcements, including some impromptu ones. I wanted to become a teacher when I was at primary school. As to what kind of teacher, I wasn’t sure, but it was the first thing I wanted to be. In my family, there are quite a few teachers. As I grew older, I increasingly thought that it would be impossible to be a teacher: how am I supposed to know everything and have all the answers? Having been in a system where spoon-fed education is the norm, my view of a teacher is that a teacher transmits knowledge to the student. Then I moved to Britain and started in a boarding school. My world changed and I changed. I learnt about a new type of answers: my own interpretation as long as it is supported by evidence and credible sources. I no longer had to produce something exactly like the model answer. This new ‘freedom’ frightened me a little at the beginning but soon I began to love it and couldn’t imagine it any other way! In a way, I was in a unique position to get the best of both worlds. I had the discipline to study ‘hard’. At the same time, I have been encouraged to think, formulate, argue and defend my own opinions. I could use my understanding to construct my own meaning. I was given a voice, mine! Teachers took on a new role in my mind: they raise curiosity, ask leading questions to fuel our needs to find out, encourage us to think and experiment, make us realise there are no clear or black and white answers all the time. A teacher acts as a guide, it is up to the students to decide how the journey would take shape. Teachers scaffold and inspire so students can go on their own unique journey: the learners decide whether to take detours, go off the track, get on the motorways or make revisits. As learners, we are finally rewarded to use our brains to make meanings and understanding of our own. The most powerful tool I took on board was that the students could also be the source of knowledge – as I had found out in my pure maths classes when my teacher wasn’t able to work out the answer before I did. Or perhaps she did that on purpose! I didn’t think about my own learning so much back then but somehow my experience of both worlds have made me the kind of learners I am today: I take responsibility, I am comfortable with uncertainties, I stay curious, I think for myself, I like asking questions. It was a struggle, but the struggle had made me independent and autonomous. I learnt to rely on myself in finding my own way. Learning becomes an exercise of figuring out how and what questions to ask, especially meaningful questions. To be able to ask the ‘right’ questions, one must listen, process, digest, interpret and respond. What impact did my teachers have on me? I believe it is not just or even so much the way they taught but the persons they were while they taught. The things I remember about my favourite teachers are the persons they were, the energy that came across from their teaching and the enthusiasm they instilled. They are also the teachers who care – about their learners, their professions and their own passions. Respect can never be conveyed through false pretence. We can tell if someone takes something seriously or not. I remember almost none of the details my teachers had taught me but I was well trained on critical thinking and on the process of working things out for myself. Above all, I learnt that teacher can be questioned too – he or she might not always be right. So to come back to my own path on becoming a teacher, it is clear to me that being a teacher seems harder than ever, but many of my current perceptions on what constitute a good teacher are compatible with my personality. Questions are welcome, it is fine not to have the ‘right’ answer, it is vital to be able to improvise and to adapt – as long as what I do help my learners think for themselves and find their own way to understanding. That to me is the most important and exciting challenge for any teachers. It is true, it is tough to be a teacher but it is also one of the most challenging professions. Do you have the courage to take it on? What would an effective differentiated classroom look like? What would an administrator want to see as evidence that you are differentiating effectively? For the teacher to start where the students are, she must know her learners in terms of their needs, readiness and interests. Each unit will begin with a pre-assessment activity so the teacher can gauge the levels each student is at so she could adjust her instruction accordingly. What kind of classroom environment do we expect to see? “I only attempt to provide the conditions in which they can learn”, Albert Einstein. The administrator will probably notice that each student is engaged at the task chosen or assigned, no one is idled as anchoring activities would be in place and the students would know it. The students would know when, where and how to get help or supplies either from their peers or from the teacher. There might be designated time and place when help is available. The students will also know how to signal for help, and while they are waiting, they would be engaged in doing anchoring activities the teacher has established the routine for. The students themselves could be assessing their own performance, they might be keeping a log on which they can choose and assess their own performance or effort on the anchoring activities. In such a classroom, the students would feel safe, welcomed, valued and confident even though they might be doing different activities or exercises, starting and stopping at different times, because they know that the teacher is differentiating her instruction so everybody is learning and being challenged at the level appropriate to that person and that person alone – everybody is stretched. The teacher respects each student, knows their names, and assigns or provides choices of tasks that are respectful for each student. How about teacher instructions and student groupings? The teacher might give whole class instructions or small group instructions. Sometimes the small group instruction might be given out as task cards or recordings. Alternatively a student in each group before class (someone who remembers and listens well) might be told what to do – as Ken Wilson says, with talent/ability “comes responsibility”. The kind of grouping would depend on the activity or tasks – they are flexible and dynamic. Sometimes it might be based on interests, sometimes on readiness, sometimes on how students prefer to learn, sometimes on how students prefer to produce (in terms of assessment). Sometimes the student works alone, sometimes in pairs, sometimes in groups. The teacher will be moving around the room monitoring the progress of the learners engaging in different groups, activities, or tasks and providing help when necessary. When presenting and exploring information and resources, these would be done through a multitude of channels. The students might be given information visually, in audio, with realia, via music, through puzzles, in ways that involves doing, in ways that the students can make connections to their own experience, or in ways where students could be engaged in conversations with their peers on the topic. In terms of assessments, there would be constant pre-assessments, and ongoing assessments in the formats of formative and summative assessments. Mutli-option and tiered assessments are often used. Signs of progress of the individual will be valued over a standardised benchmark grade, but all students would have had the chance to master the core curriculum, the big ideas and essential principles (the learning goals) during the units. Often there might not be a single correct answer but a range of possibilities depending on your perspectives. The students are comfortable with different viewpoints and uncertainties – they are OK with the fact that “perfect” answers might be different for each person or they simply might not exist. The students would understand that uncertainties drive us to experiment, be creative and be original and accept that uncertainties also come with risks. The students would be aware that everybody learns differently and that they are responsible for their own learning, they will become autonomous learners with help from the teacher, their classmates, their parents and the school. They can reflect on their learning and progress possibly by ways of using a journal or a log. Does your classroom look anything like this? Mine is certainly a long way away but I sometimes see glimpses of such “EDI” (effective differentiated instruction) moments. Perhaps the better question to ask is to what extent does your classroom look like this, or even, would you like your classroom to look anything like this one day? The thing is differentiating effectively takes time, if you are starting out like me, taking a small step at a time, seeing evidence of one, a couple, or even a few of these signs would be gold. As pointed out by a teacher practising DI, “Meaningful teaching not only reflects the skills we acquire, but also the person we seek to be.” (Carol Ann Tomlinson & Marcia B. Imbeau. Managing a differentiated classroom: A practical guide. 2011:95) What kind of person do YOU seek to be?